With the IE8 launch pending, here are our latest (Q4 2008) IE8 stats from the Tourism WA eMarkeplace sites. 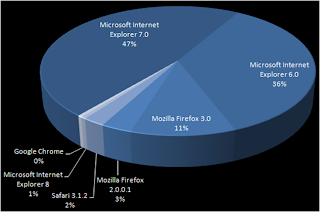 I'm curious to see how quickly users adopt the next Internet Explorer release and how it affects the current IE browser share breakdown. The number of visitors on IE5.x, for instance, is negligible; should we expect IE6 to be squeezed out as well or is it more sensible to think IE6 users aren't using Windows Update and current IE7 users will end up on IE8 before we see any drops in the IE6 share? Who knows--should be interesting though!